If the first animal you think of when you hear the word majestic isn't a camel then we do not know what is going on in that cranium of yours. Think about it! The camel is basically the unicorn of the desert, only instead of a frightening horn protruding out of the middle of its head it has an elegant hump, sometimes even two, properly placed upon its back. Not only are camels majestic, but within the Arab cultures, the camel has become a symbol for patience, tolerance, and endurance! 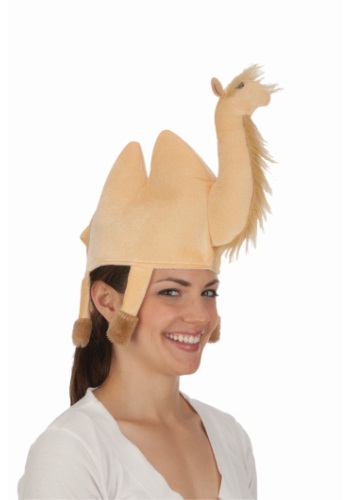 Now you can be a beautiful symbol of peace when you walk around the party with this Camel Hat! Even if tranquility isn't the first thing to pop into other's minds when you walk in the room, you can bet that you'll be able to ease any amount of tension and offer a few good laughs with this cute hat. Once Halloween passes then you can still have this lovely desert creature ride upon your head every Hump Day!